The first experiments with dialysis were performed using a dog in 1913. John J. Abel, L. G. Rowntree, and B. B. Turner built a machine that pumped blood through a special membranous (thin, soft, and pliable) tube submerged in a liquid called dialysate. This tube had microscopic holes in it that let the waste products in the dog's blood seep through it and into the dialysate. One of the main problems that the experimenters had was that the dog's blood kept clotting. Until heparin, an anti-clotting medicine, was discovered, not many advances in dialysis were made. Heparin was discovered by W. H. Howell in 1922. A transparent material called cellophane (used to separate waste products in the blood from the beneficial substances in it) was also invented. In 1945, William J. Kolff of Holland built the first dialysis machine that could be used by humans. Modifications by J. Merrell, K. Walter, and others in 1947 produced a smaller, more effective machine. 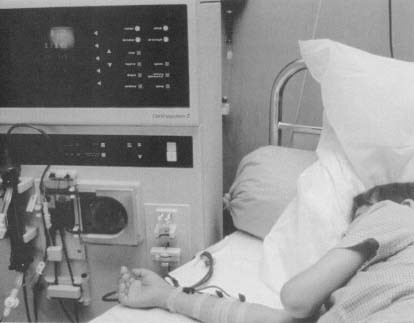 A young patient receives dialysis treatment. membranes, diffusion, and osmosis. Humans have two kidneys through which blood is constantly being pumped. Special cells called glomeruli are responsible for removing waste products from the blood and at the same time balancing the amount of water in the body. There are also different kinds of particles (molecules) in the body that the kidney can separate, keeping the beneficial ones and excreting (getting rid of) the harmful ones. The average human weighs about 70 kilograms (155 pounds), of which about 60 percent is water. This means there are about 40 liters (42 quarts) of body fluid. The body is made up of many cells. These cells and the surrounding tissue are responsible for storing the body fluids. There are two main compartments in which this fluid is stored. One is inside the cell and the other is outside the cell. These two compartments are separated by a wall called the cell membrane. The cell membrane is a wall composed of three main building materials: fats, carbohydrates, and proteins. It is built this way so that only certain molecules can pass through it. This type of membrane is called a semipermeable membrane. Certain processes and conditions regulate the pressure and the flow of molecules through cell membranes, including permeability (some molecules can pass through but others cannot), concentration (there are different amounts of molecules on either side of the membrane), electrical potential (each molecule has an electric charge), and pressure (there can be different pressures on either side of the membrane). Diffusion is the continual movement of molecules in air or water. Diffusion takes place when there is a greater concentration of molecules in one space relative to another. A simple experiment to demonstrate diffusion can be performed with perfume. If the perfume is placed in a shallow dish in the middle of a room, eventually it can be smelled everywhere in the room. That is because the molecules of perfume have diffused from an area of greater concentration (the dish of perfume) to an area of lesser concentration (the room). If a filter is placed over the dish of perfume, the smell might be a little bit different or weaker. This filter is similar to a membrane that allows only certain molecules to diffuse across it. The movement of water (a solvent) across a membrane where there is a different concentration on either side is called osmosis. This means that in a container divided by a semipermeable membrane, with water on one side and a solution (water and other molecules) on the other, the water will flow through the membrane to the solution. The flow of water can be prevented by applying pressure to the solution side. The amount of pressure needed to stop osmosis is called osmotic pressure. If pressure is not applied and osmosis is allowed to proceed, then osmosis stops when the water pressure (hydrostatic pressure) is equal to the osmotic pressure. There are two different kinds of dialysis used in medicine: hemodialysis and peritoneal dialysis. The methods for performing dialysis may be different, but the goal of the treatment is the same, that is, to remove waste products. These wastes are composed mainly of nitrogen in the form of urea, uric acid, and creatinine. Hemodialysis is diffusion across a semipermeable membrane (one that allows only certain molecules to pass through it). The semipermeable membrane is used to remove the wastes from the blood and at the same time correct the level of electrolytes in the blood. Before hemodialysis can be performed, a surgeon must make a way for the blood to be pumped out of the body and then be returned after it has been cleansed. To do this, the surgeon uses an artery and a vein in the forearm. Arteries (which have muscles in their walls) bring oxygenated blood to the body from the heart, and veins return blood to the heart, which needs to have oxygen. The surgeon connects the radial artery in the forearm to a large vein called the cephalic vein. This connection is called an arteriovenous shunt. A shunt carries something from one place to another. In this case it carries blood from an artery to a vein. After this shunt is made, the veins in the forearm get big and eventually form muscles in their walls like arteries. They are now strong and can be punctured many times for dialysis. Once the patient has a shunt, it is possible to connect the patient to the dialysis machine. A dialysis machine has three different parts. They are the tubes to get the blood to the machine, special filters (membranes) through which the blood passes, and a special solution called dialysate. The dialysate also has bicarbonate in it to make it similar to body fluids. Blood travels through this membrane in one direction, and the dialysate is pumped around the membrane in the other direction. As the blood passes through this semipermeable membrane, all of the nitrogen wastes in the blood go into the dialysate, which is drained once it has been used. There are also higher levels (concentrations) of electrolytes like potassium and sodium in the blood. A lower concentration of electrolytes, the amount that should be in the blood, is used in the dialysate. As osmosis takes place, electrolytes in the higher concentration (the blood) move to an area of lower concentration (the dialysate). Before the cleansed blood is returned to the patient, protamine, which deactivates heparin, is added. Most patients have to stay connected to the machine for about three or four hours, three times a week. The other kind of dialysis is called peritoneal dialysis. The inside of the abdomen is lined with layers of cells called the peritoneum. The peritoneum acts like a semipermeable membrane. After a special tube, called a dialysis catheter, is placed in the abdomen, dialysate fluid (saltwater combined with sugar and electrolytes) is put inside the abdomen and allowed to stay there for several hours. During this time, the waste products from the blood diffuse by osmosis into the dialysate. This fluid is then drained off, and fresh fluid is added. Since this kind of dialysis takes longer, the patient has to do it several times a day, every day. I am interested in the topic and will like to know more about the topic, suppose i want to buy the machine, how will i get it and what is the price range of the machine. just saved me from my science worksheet. very useful information. but why the dialysis tubing is not a straight ube, but made up of many folds? thi's verry good iformation...but i hope ta take the block digarame of all part of dialysis machine plzz...i can?? what is average size ( approximatly),weight, and cost of comercial hemodialysis machines? My name is Bobby Charter. I am an expert in Dialysis, and am a PHd in human bilology. I am a surgeon at the New york central hospital. A 2009 version of the dialysis machine will cost you aroun 11250 dollars. It cost a lot! I hope i helped you guys. The machine costs between $25000 to $35000 it depends on what model and u have to be trained dialysis technician to operate it. I am interested this topic.i want to need if any hi tech machine or high purified machine available please mail me. because dialysis going on my father so please tell me. the information given make me understand the biological concept. I want to know about the price of the machine, is there any machine that made for personal,so maybe smaller and cheaper, because not for commercial used such in the hospital but personal used at home. thanks in advance for the soonest reply and regards. Could you please help me to write or draw the parts of the dialysis and tell me the name of the dialysis machine and thank you. what should i do when the tube come out the vein when they have dialysis?? please some one help mee?? should i leave it like that or put it back in? why sometimes there are blood coagulation during the dialysis(inside the dialyzer)in spite of adding heparin. ask the price of dialysis machine bec my fasther alwys go to hospitl for dialysis . in 1wk 3times to dialysis my father in ther hospitl .im asking the price if we cn afford that.